Boutique - Jade Wellness Studio - Yoga, Pilates and Wellness in Sault Ste. Marie, Ontario. At Jade, we carry products that help create a natural and healthy lifestyle. You can find items that support your yoga, pilates and belly dance practice as well as everyday comfortable and Eco-friendly apparel. We also work closely with the local community and showcase items from local artisans such as Augie by Carrie and HuckSacks by Vicki Young. Find Eco-conscious and "made in Canada" gifts to pamper yourself and loved ones right here in the Sault! Inner Fire was founded by yoga teacher and artist Leah Emmott. In late 2011, Leah had to undergo emergency surgery for an ovarian cyst that had grown to the size of a grapefruit. After the surgery, she was ordered to take an entire month off from her job as a yoga teacher and fitness instructor. So she brushed off her old sewing machine and started making meditation cushions. She gave her friends the cushions and they said "these are nice, you should sell them!" She thought "well, if I start selling these, I should probably call it something!" The name Inner Fire came to her mind because she felt like the cyst in her belly was replaced by what yogis call "Agni", an internal fire that allows us to live our passions. Inner Fire now creates yoga apparel that honours Mother Earth. Their leggings are locally made from recycled water bottles and are BPA free. All garments are sweatshop-free and are made in North America (Vancouver to be exact!) and all shirts are hand printed with love in their small studio. They believe in giving back to the greater global community through philanthropic initiatives. Leo Star Athlectica is a Vancouver based yoga apparel company with a philosophy of balance, purity, simplicity and peace. We are pleased to carry LeoStar, a brand of energetic athletic wear - tops, bottoms and outer wear - inspired by a deep love for yoga, Eastern wisdom, and the never-ending search for comfortable clothing. Whenever possible, Leo Star produces and manufactures their clothing in Canada. Lucia is the creation of Lucie Bernier and Andre Pace, a husband and wife team in Montreal, Quebec. Their goal is to make good products with good ingredients, using only 100% pure organic grade essential oils, 100% natural vegetable & botanical hydrating oils, and only food grade, vegetable based colors that are not tested on animals. Recycled paper and vegetable based inks are used for all promotional materials. 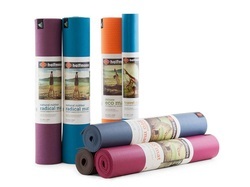 Halfmoon Yoga Products has been hand-crafting exceptional products for over two decades. We consider our community and our planet in everything we do. Our roots are in yoga, it's what we know and love. Our connection with you - on and off the mat. Enjoy a sensory experience while using Aromatica aromatherapy products. All natural ingredients and organic essential oils are used in every hand crafted item. Choose from a variety of premade blends or buy single oils and create something original. Aromatica essential oils, massage carrier oil, shower gel and bath salts are all available at Jade Wellness Boutique. 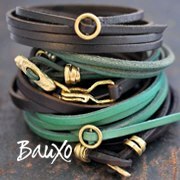 The idea for BauXo was born when two Canadian women, Jeneen Gacek & Diana DeLuca, decided to take a sabbatical from their corporate lives and back-pack through Southeast Asia. On a beach in Bali, Indonesia they met Javanese designer Hariyono and instantly fell in love with his work. This energetic trio soon discovered they shared a mutual passion for life and for fashion. With their blend of professional backgrounds, cultures and characters, they joined together and turned their entrepreneurial dreams into reality.